What is a Merit Scholarship, and How Can You Get One? So college is in your future, and you’re already dreaming about it. Plastering your dorm room with posters, grabbing some coffee before your sociology lecture, opening a book outside to study—and then promptly closing it, because you chose an inordinately windy day for this, and it’s really making it difficult to concentrate. But that all sounds so expensive. Especially today, college tuition is through the roof. And according to sources like MeritAid.com, the cost of tuition increases about 8% each year. Sure, you hear people toss around the word “scholarship,” but where exactly do those scholarships come from? And besides, don’t you have to be an athlete or a star student or a redhead to get them? And even if you were qualified, you’d have to spend hours on applications, and, let’s face it—you just don’t have the time. Merit scholarships have come to the rescue! Strap in. You’re going to want to hear this. Unlike need-based financial aid, merit scholarships do not take your parents’ salaries into account. This means you won’t fall into that awkward space where you’re too rich for grants, but too poor to throw thousands of dollars at a college education without so much as a blink—otherwise known as the Uncanny Valley of College Expenses. Great news, right? You’d never guess it from the name, but merit-based scholarships are scholarships based on merit. If you have a high GPA, and you score well on the SAT and/or ACT, you’re golden. What? It can’t really be that easy, can it? It can. And it gets easier. You know those applications you’re worried about? There is no application process for merit scholarships. If you send in your regular admissions application, and you qualify for the scholarship, the university will often automatically send you a notice (and a check). 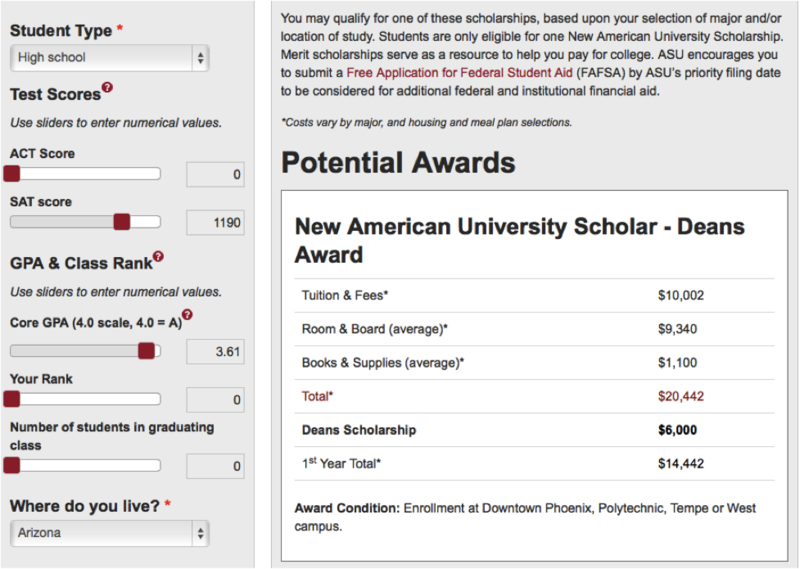 How much can I get from a merit scholarship? Okay, so you’re probably thinking this sounds too good to be true. You practically just have to sit back and relax and the money comes rolling in. Yeah, right, you say. This mysterious internet person is scamming me. There has to be a catch. Maybe this is a virus. Nope. Not a virus. But you might find this information so good it’s…infectious! …anyone? Sorry. 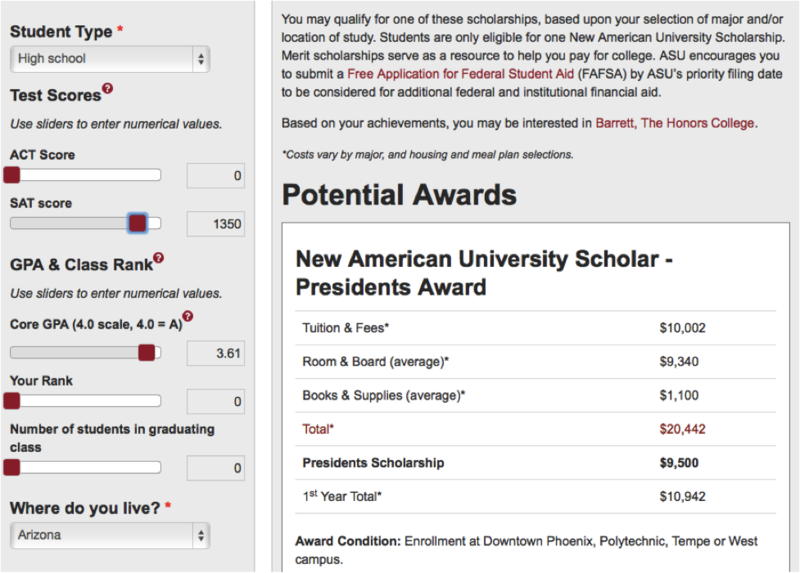 Anyway, if you’ve looked around at any private scholarships, you’ll probably notice that they don’t give out very much. 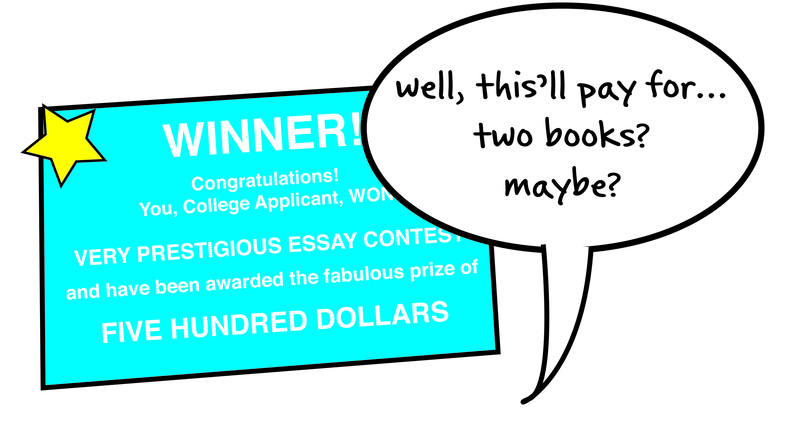 You spend hours on an essay, just for it to be tossed in a pile, judged, and maybe awarded something like $500. And, I mean, $500 is okay, but it’s barely a sneeze in the bucket of college expenses. You know that book you were trying to read outside? Probably about half that sum. In fact, over 11 billion dollars are given out each year to incoming college students across the United States. How high do my GPA and test scores need to be? This is a question best answered on MeritAid.com, where you can plug in a few key pieces of information—your ACT and SAT scores, your GPA, and your class rank—and find out which awards you could potentially receive upon acceptance to the university of your choice. But for the quick and dirty answer, let’s look at a few examples. Here’s one kid who did all right on the SAT—an 1190 out of 1600. And his GPA was a 3.61. And at Arizona State University, he would have an award of $6000 a year locked down. And $6000 is definitely good. But what if he managed to earn only 160 more points on the SAT? With a small test-score tune-up, this mysterious future college student is now eligible for $9500 a year. That’s a $3500 annual difference, and covers tuition almost entirely. How can I make sure I qualify? Believe it or not, it’s easier than you think. I’m not talking staying up all night doing practice questions. But as soon as you can—especially if you’re in your first or second year of high school—start familiarizing yourself with the format of the test. Make sure your math and reading skills are sharp. Think about test-taking strategies. I know this sounds daunting, especially if you’re not sure where to start. But there’s no need to be afraid! There are plenty of resources designed to help you. In fact, the best and most effective way to begin your journey is definitely somewhere around here. 2) Get help before it’s needed. When you’re trying to keep your GPA high, make sure you take advantage of the help available. Don’t wait until it’s too late, because it’s much harder to raise a GPA than it is to sink it. Did last night’s homework assignment make less sense than you were hoping? Are you feeling okay about a class, but worried you might not do well on the upcoming test? Don’t wait! Ask the TA, or an older student, or your school’s tutoring center. Email your teacher and meet with him or her for some one-on-one assistance. Take your grades seriously, and the universities will take you seriously. And soon you’ll have cash awards to show for your troubles. 3) Take the right classes. 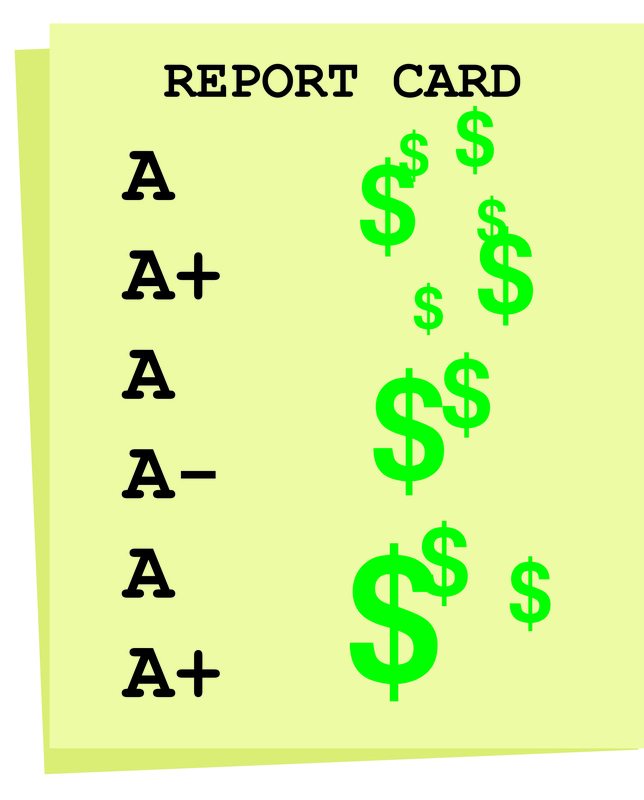 Taking a bunch of AP and Honors classes looks good on your transcript, but only if you get A’s. Otherwise, they can actually bring down your unweighted GPA, which is what colleges look at when disbursing merit scholarships. That being said, AP and Honors classes have a lot to offer. AP English and History classes can definitely help with your ability to write essays quickly and well. AP English especially helps sharpen your vocabulary and your analytical reading skills. Struggling over difficult problems in AP Calculus makes the SAT math section look like a piece of cake. 4) Consider an SAT class. You might have heard about these classes and rolled your eyes, but they exist for a reason! They’re taught by people who know what they’re doing—especially with test strategies. They teach tried-and-true methods for raising your score. And, sometimes, they’ll offer free e-classes to help get you moving in the right direction. With thousands of dollars hanging in the balance, what’ve you got to lose? Suddenly, the dream of college seems like reality again. You can practically feel that book in your backpack, heavy and sure. Seriously, who knew that by putting a little more effort into your GPA and SAT scores, you could walk away from high school with a diploma in one hand and thousands of dollars in the other. Check out MeritAid.com for more information on the scholarships your university gives out—and when you get there, let me know, and we’ll meet up for coffee before your sociology lecture. In fact, maybe you can pay for my coffee as a little thank-you for all that extra cash.